American chef François de Mélogue, founder of award-winning restaurant Pili Pili in his hometown of Chicago, is a strong advocate of regional French cuisines, specifically the rustic cuisines of Lyon and Provence. He tells us about his first experience at Paul Bocuse restaurant (part 1/3). Shortly after Paul Bocuse passed away in January, my wife and I made a point to go dine at Auberge du Pont de Collonges, part as an homage to someone who richly influenced my career as chef and part to eat there before anything was changed. This was my virgin experience at Bocuse, though it should have been the second. A long time ago, perhaps in another life, I slept through a reservation personally made by Georges Blanc after I discovered truffle eau de vie tucked away in his kitchen the night before. I will freely admit, I went to Bocuse with serious trepidation in my heart and stomach. I was prepared for a costly experience but had heard from several people that Monsieur Bocuse’s cuisine was tired, outdated and frankly not worth it. I wondered long and hard whether this experience could match my lofty expectations, or simply be one of those moments in life you anticipate so much but in the end, fails to deliver the goods. We left Lyon and drove the short distance north along the Quai Clemenceau to Pont Paul Bocuse. I remember the childlike sensation of joy I felt when the green and red building with Paul’s name in gigantic letters came into view. It reminded me of that incredible feeling you got on Christmas morning when you were awake enough to realize what day it was. Everything from the moment you pull up to the colorful historic restaurant, to the gracious welcomes to the visual aesthetics was absolutely perfect and impeccable. Before I tell you about my meal I must start by addressing the outdated and tired concerns for those facing the same dilemma I felt. Understand fully where you have chosen to eat. If you are coming to Restaurant Paul Bocuse looking for the current rage of a thin line of food on one small side of an overgrown plate, with multicolored gel dots, radish slices and pluches of flowers hiding the food beneath, then thankfully you are at the wrong place. You would be much better-served dining at a trendy Parisian or New York restaurant where the kitchen staff will tweezer your food to death. If you came to try the food that launched a young man into culinary superstardom, then you are about to experience what I imagine heaven must taste like. 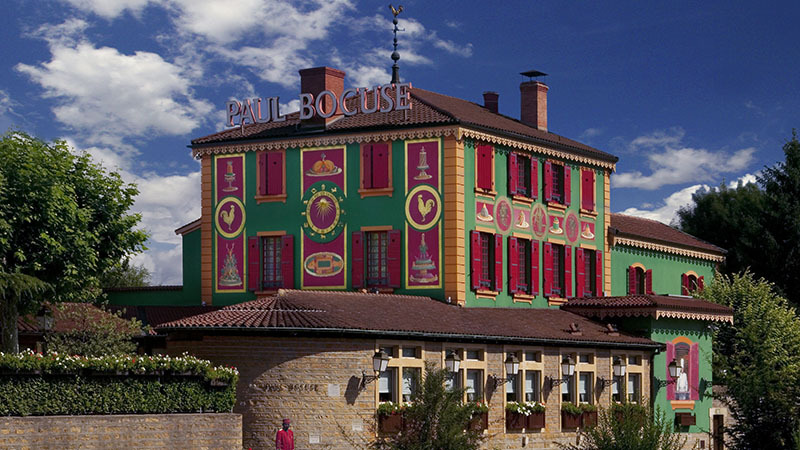 You go to Paul Bocuse to celebrate the classics, period. You go because of the divine lineage of the feu sacré, or sacred fire, that was triumphantly carried by Paul throughout his absurdly long and influential career, passing through some of the most amazing restaurants in all of modern history. The Bresse chicken cooked in a bladder is a testament of this lineage. The dish originated in the 1800’s by Mére Francoise Fillioux (1865 – 1925) and then moved into Mére Eugénie Brazier’s (1895 – 1977) repertoire when she opened her own restaurant. 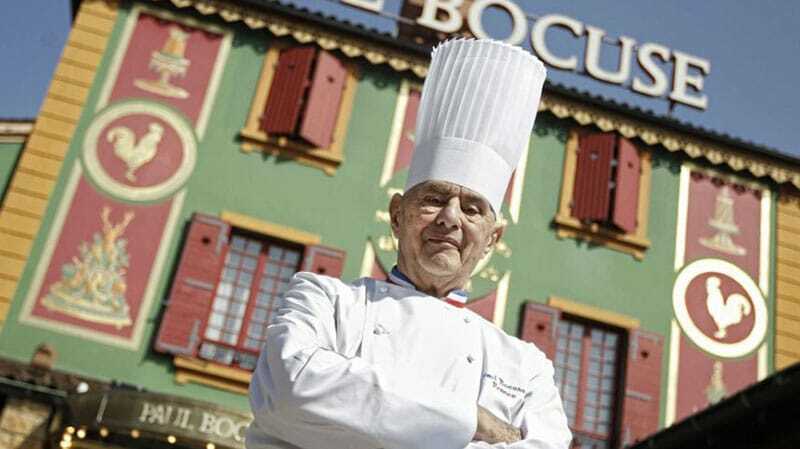 Chef of the century Paul Bocuse. It should be noted that Mère Brazier became the world’s first chef to hold not one three-star Michelin rating, but two three-star Michelin ratings simultaneously. A unique distinction that was held for sixty years until Alain Ducasse got his second three-star rating in 1998. The young apprentice Paul came to work for Mère Brazier and learned her version of nouvelle cuisine – yes that is correct, Gault and Millau did not invent or even coin the phrase. They simply repeated a centuries-old, much-used term describing every time the old guard was replaced by the new guard. At Mère Brazier’s Paul learned many things, including that spectacular chicken dish that stayed part of his repertoire till the end. After, Paul worked for the great Fernand Point’s groundbreaking La Pyramide and brought Point’s sensibilities and grand dishes from the mid 1900’s into our time. This is why you eat at Bocuse. Paul never forgot his origins and it was evident in his cooking, in the murals outside the front door and even in the banquet room dedicated to his mentor Point. It’s still an unbelievable opportunity to go to a restaurant and dine on the classics that originated during such an important epoch in modern gastronomy. The experience is a time travel through a small, rapidly closing window to another time. 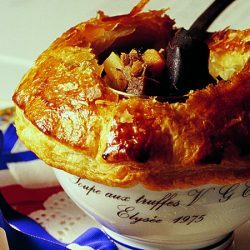 When the time is right, and honor has been sufficiently bestowed upon Paul, I do hope the family goes the route of La Tour d’Argent in Paris and maintains part of the original menu as classics never to be removed, but also allows the new chef freedom to add his voice to the magnificent choir. But this isn’t a history lesson. For that, you can simply google the name Paul Bocuse and sift through the millions of tributes, stories, and videos that will show up in the results. My purpose is solely to put the meal into context and help ensure your expectations will properly match the dining experience. 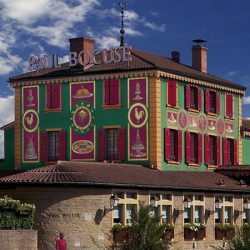 Thank you so much for publishing our article about our experience at Bocuse; we can’t wait to return!